Happy Monday my loves! Spring has (finally) sprung in NYC and I got a chance to enjoy a fabulous weekend with my family. On Saturday Billy and I brought Taylor and our nephew to Sahara Sam’s Oasis in New Jersey. I will be doing a full post on it (with a giveaway!) later in the week but the short version is that we had a BLAST! It is still a little too cool to be enjoying any sort of outdoor water sports so it was nice to enjoy the indoor facilities. They keep the temperature at a toasty 80 degrees and it really felt like Summer to be donning a bathing suit! The kids had so much fun and did so much running around that at the end of the day Taylor sat down and started to fall asleep while picking out prizes in the arcade and then they both passed out cold during the car ride home! On Sunday I woke up early and started running errands. It was Sunny and gorgeous out and I got so much accomplished. I dropped off my dry cleaning, got my car washed, got a mani/pedi, went food shopping and we had brunch with friends. Taylor and I donned our favorite maxi dresses (Spring fashion is so much more fun than Winter). I hope you all had a fabulous weekend as well and got to spend some time outdoors! 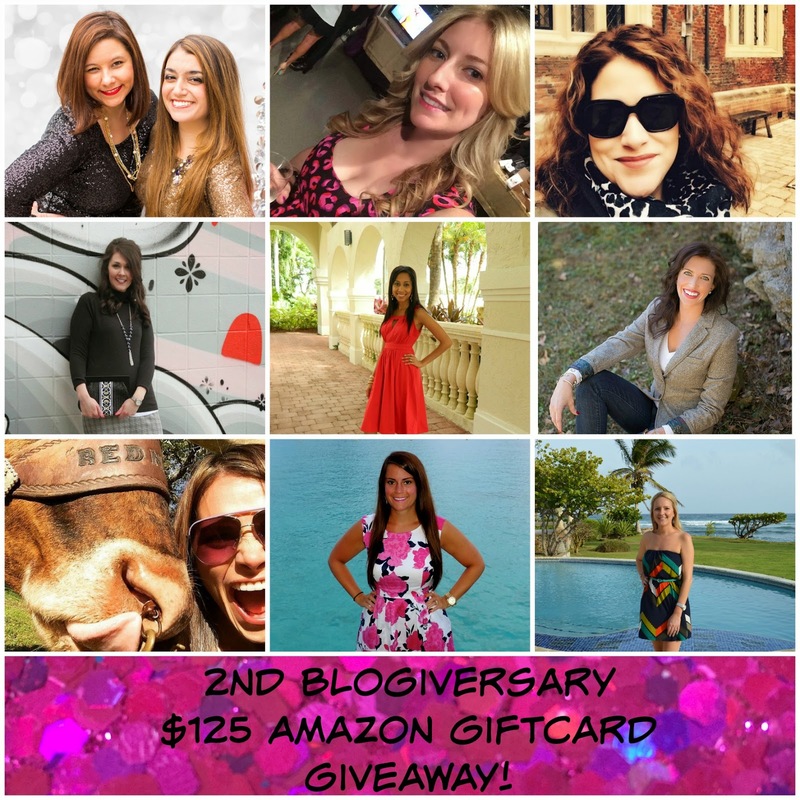 Today I am also teaming up with a fabulous group of bloggers to give away a $125 Amazon gift card to celebrate The Sequin Notebook’s 2nd Blogiversary! You can enter via the Rafflecopter widget below and be sure to give all of these gals some love by following each of their links – after all, every link is one entry closer to winning! The giveaway will run from now until midnight on May 12th – good luck gals! This entry was posted in Giveaway and tagged blogiversary, giveaway, sahara sams, sequin notebook, Weekending on May 4, 2015 by Pamela Bannon. Thank you guys so much for all the love! I was totally blown away by all the positive vibes that came in as a result of my Blogiversary post! I also want to give a shout out to all the fabulous vendors that collaborated with me on this! Without further ado, here are the winners! If you were one of the people listed below…CONGRATS! I have sent you an email on how to redeem your prize. If you did not win during this giveaway, keep your eyes peeled because I have another fabulous contest starting at the beginning of the year with some of my favorite bloggers! This entry was posted in Celebrate and tagged blogiversary on December 17, 2014 by Pamela Bannon.